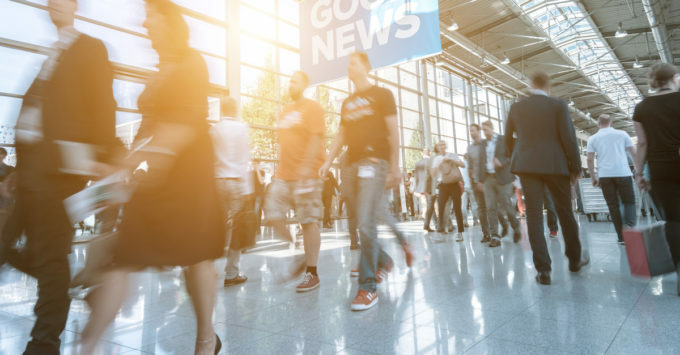 Trade shows are some of the best places to meet new people, make new connections, and get more leads. Making connections and getting leads is the whole point of going to a trade show. No show is complete without a system in place for getting the most of your time around soon-to-be partners and customers. Here are three tips you can follow to take your networking experience to the next level for your next trade show. We’re not saying that people just want to meet you at a show to see what they can get from you. But we are saying that the point of a show is to build professional relationships based on mutual needs and benefits – and that’s why you need to be very clear about who you are, what you’re looking for, and what you have to offer. This does not exclusively mean your signage and your trade show booth – although clarity is very important for those, too. It also means you need to be concise and clear with how you describe yourself and your brand. Too many connections are missed due to a lack of clarity. Hone your value proposition and elevator pitch until you can say it comfortably and with brevity. Don’t use two words where one would do. Every networking opportunity is like a date. You have two people who probably do not know each other, but know enough that there’s an opportunity there – if it’s a good fit. To find out if a person is a good fit for your business, you need to ask the right questions. There is no list of magical questions to ask. It will vary from business to business. Think about what an ideal customer looks like, and then identify questions that can help you find out if the prospect is a good fit for you. Let your conversation flow naturally, though. Don’t interrogate a prospect. Instead, ask them questions that lead to conversation that leads to other questions and even more conversation. You get bonus points if you have a way to get the prospect to volunteer information about themselves, such as asking people to also fill out a survey or volunteer contact information. Every trade show attendee needs something to give away. These aren’t just for fun, though, and they aren’t just for brand recognition either. Trade show giveaways, if used properly, serve a prime purpose: giving your prospect something useful that makes them remember what you’re all about. A business card is a good start, but a professionally-done handout or piece of literature made specifically for that show – not something generic – is a great thing to include along with the fun, trendy item you brought to the show. So, don’t just give them a coozie or a lanyard. Give them something they can read or watch that reminds them of who you are, what you do, and what you can offer. If it is creatively done and well-written, and has value for their business, then they will read it. And when they do, you will be one step closer to getting new business. Design Display designs and manufacturers trade show exhibits for virtually any industry. Check out our portfolio or contact us for more information.